Michael Ondaatje began his career as a poet but is best known as the author of the 1992 Booker Prize-winning novel The English Patient, which was made into a critically-acclaimed motion picture. He was born in Sri Lanka (formerly Ceylon) in 1943; he moved to Canada at age 18. His archive documents in great detail his working methods and demonstrates his centrality to the literary and cultural communities of Canada and the broader world over more than 50 years. 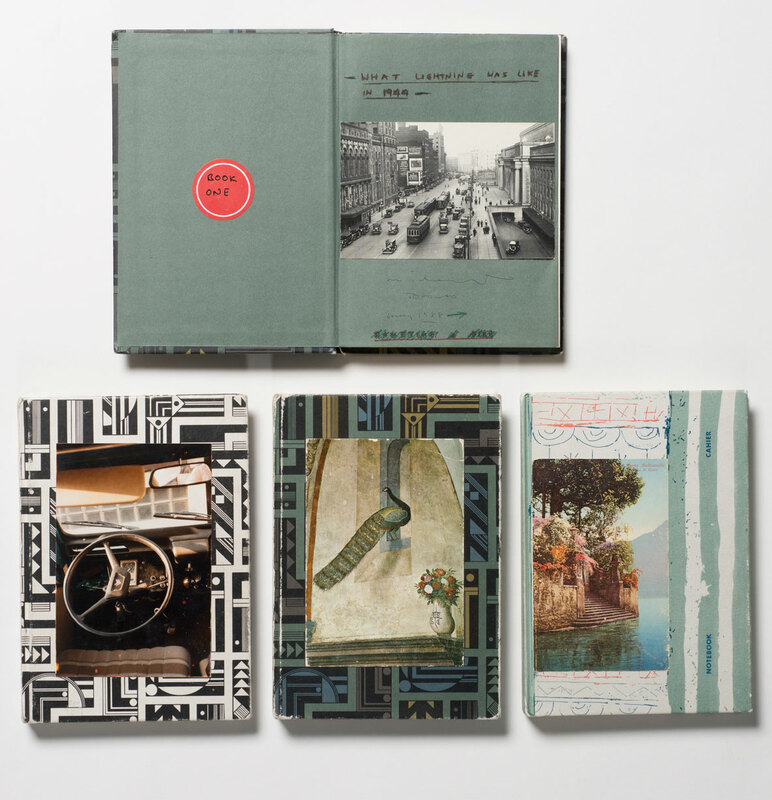 Notebooks containing the first draft of Michael Ondaatje’s novel The English Patient, 1988. Photo by Pete Smith. 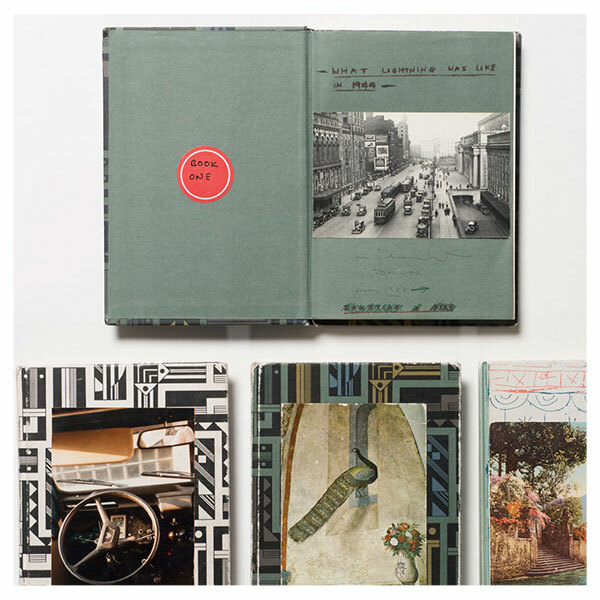 Your archive contains a number of notebooks which you have made into scrapbooks and interspersed with found images of different kinds. What is the relationship of your novels to this visual imagery? Well these so called “notebooks” are what I actually write the novels in. I usually write about four drafts of a book by hand before it moves to a typewriter or computer. After that I keep reworking it, printing it out, re-writing it by hand. So during those early stages of handwriting the novels, I sometimes need a few visual breaks along the way; I might stick in someone’s poem fragment, just a few lines, or perhaps a stray visual image of a party at Oxford where quite a few are drunk that I came across in a magazine. There might be perhaps some subliminal influence. That party scene got totally recast into a scene where Almasy imagines meeting Katharine when she was young, long before he actually met her. When I came upon that long ago notebook years later—that was the first time I realized and recognized its influence on a scene in The English Patient. Often I glue in an image on top of a section of prose that had been re-copied into the next notebook, so the notebooks are not quite chronological. Anyway, they are not just scrapbooks. This is where the novel gets written and thought out, each notebook reflecting a specific stage in the making of it. I always enjoy the look of these handwritten book more than a typed manuscript. Ideally I would like to publish a novel that way, but my handwriting is terrible, unreadable, even to me sometimes. 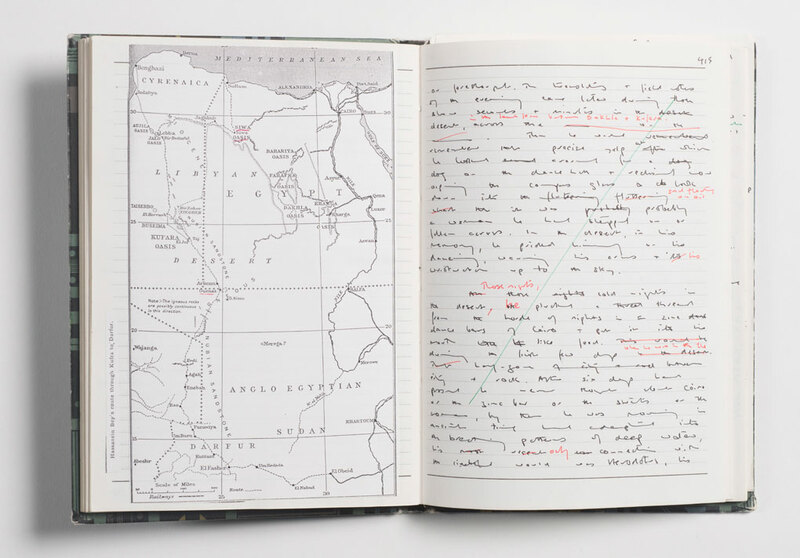 Notebook containing a handwritten draft of Michael Ondaatje’s novel “The Cat’s Table,” 2009. Photo by Pete Smith. Many of your characters have been displaced by historical events, yet you’ve noted the importance of place in your process of composition. What is the role of place for characters who have no place to call their own? When I begin a novel I don’t begin with an idea or theme. Ideas and themes run out after a few pages, or they can limit you. But I need to ground myself in a precise location or time period—a farm in California, Louisiana in 1912—in order to let the book evolve without drifting off into something surreal or unstructured. I need the historical moment, a time period. So in that limited setting the characters who emerge and act are freer, are able to discover themselves and others. They might come together from different countries perhaps but the story takes place then, there… it could be a convent where strangers meet and are altered. This might be because my life has been nomadic to a certain extent, so the sense of place has become more important. Does your poetry inform your novels, or vice versa, or are they separate creative activities? I never imagined I would be a writer. And when I began writing poetry I never thought I would end up a novelist as well. But certainly being a poet hugely influenced my prose writing, and I suspect the structure of my novels a well. One of the essential wishes in poetry is to suggest, so the reader participates, and in a way completes the poem. You do not have to say everything, or cover everything. I always want that quality in a novel. I don’t want to be led around too carefully. Also there is the aspect of the “leap” in poetry that I did not want to lose when writing prose. Just as rhyme is not just a sound but can become a visual echo. At the beginning I could write poems and novels at the same time. Now I have to focus on one or the other. 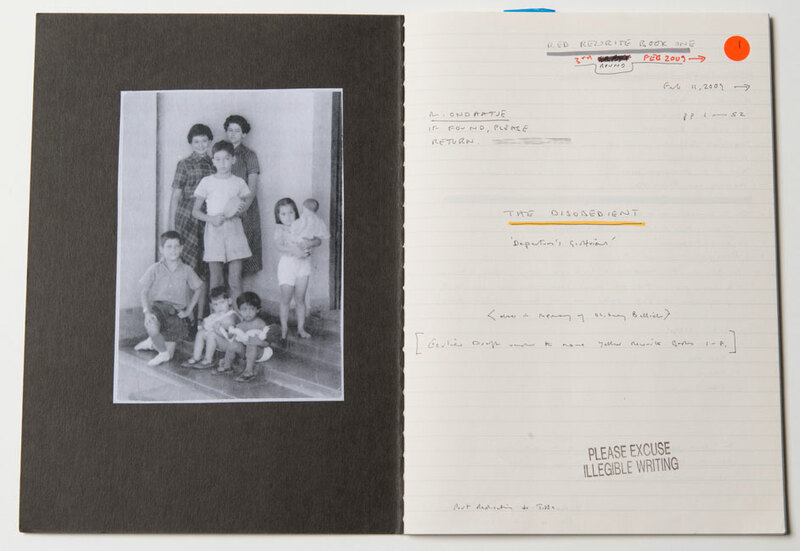 Notebook containing the first draft of Michael Ondaatje’s novel “The English Patient,” 1988. Photo by Pete Smith. In addition to your creative work, you have been quite active in a number of causes in service to literature. I’m thinking here of your editorial work for many years with Brick, your service to PEN, and your involvement with the Griffin Prize. Can you tell us about your work on behalf of these and other causes important to you? I have always believed in a community of artists—whether publishers of literary magazine, or even small theatre companies. I was discovered by a small press—Coach House Press in Toronto published my first two books of poetry. And later on I became one of the editors there. Similarly I got involved with and made a documentary about Theatre Passe Muraille, a theatre collective that was wonderful. The literary magazine Brick and Passe Muraille and Coach House Press gave me so much energy it did not feel in any way like a duty. I grew with them and learned from them as well as dedicating myself to them. Austin, Texas is a long way from your home in Toronto. Can you tell us how you came to place your archive at the Ransom Center? I visited the Ransom Center many years ago and was amazed at its photography collection. More recently I came back and was shown the literary archive, that gathering of wonders—Robert Browning’s address book, a draft of Faulkner’s Light in August, a letter from Tennyson to Whitman (who knew! ), poems by Yeats, Borges…. Another amazing community. Wonderful interview, revealing and inspiring.